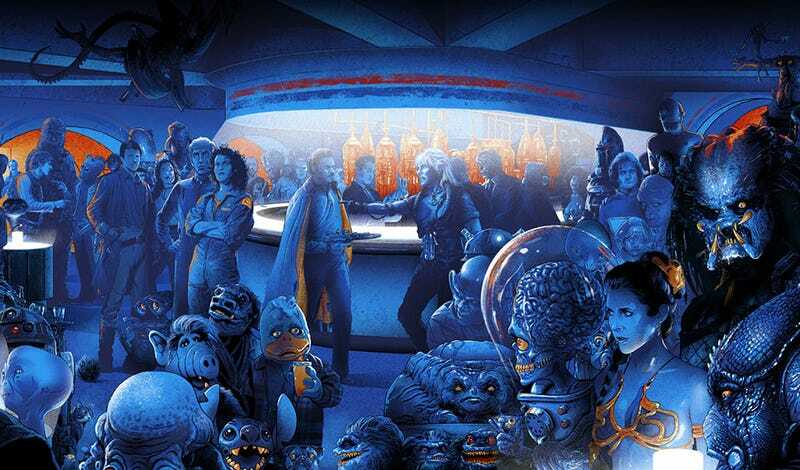 A mere crop of Vance Kelly’s epic Sci-Fi Cantina art print. Artists Vance Kelly and Kevin M. Wilson (also known as Ape Meets Girl) are teaming up for “Easter Eggs”—which, you guessed it, is a show wholly made up of artwork that is filled with Easter eggs. So, for example, here’s Kelly’s scifi cantina piece. Can you name all the aliens? That poster, along with tons from various other genres, will first be on sale at 7:00 pm on March 21 at the Hero Complex Gallery in Los Angeles, CA. The art will then go online the next morning on the Hero Complex website. If the concept looks a bit familiar, that’s because it was partially inspired by Wilson’s wildly popular Gremlins poster, which was done in a similar style a few months back. This Insane Gremlins Poster Has 84 Different References On It—Can You Guess Them All? And good news: Additional “artist proof” copies of that long-sold out poster will be on sale at the show, so if you missed it before, you can finally grab one. Can You Pick Out All the References in This Action-Packed Scifi Poster Mashup?